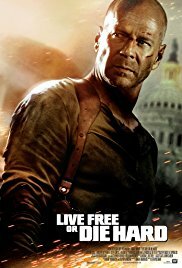 But the most irritating part for me was the one where McClane is driving a truck over a bridge and being chased by a fighter jet. This was so grotesque, so superhero-ish. This belonged in “The Avengers” or another over the top superhero movie … but not in “Die Hard“. Bruce Willis = “Die Hard”. But it’s really easy to cast him and then put on the movie poster “Die Hard: blablablablabla …”. Success guaranteed. Timothy Olyphant plays the would-be-bad-guy. An expressionless face. He still needs to go a long way until he’s as crazy as the 3 bad-asses from the first three parts. Justin Long acted very convincing as the youthful computer nerd who was almost wetting his pants with all that violence around him.